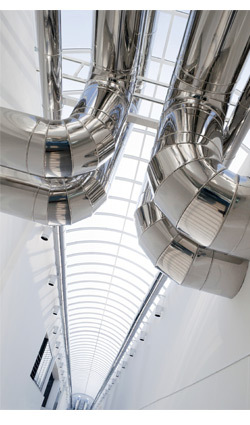 Designing a completely new commercial HVAC system? Upgrading your current mechanicals? Adding to an existing commercial structure? No matter what your need, IT Landes has the experience, skill and technological know-how to engineer, build and install an HVAC infrastructure that’s reliable, energy efficient and assured to provide years of comfort. IT Landes is your single source for all facets of system design and design-build, including geothermal technology. Whether it’s an entirely new commercial HVAC system or an upgrade or retrofit, IT Landes starts with a thorough analysis of your building’s needs and the project scope. We work directly with your builder, architect or general contractor to provide the design, engineering, and mechanical services that best fit your needs today, and we can help you project future HVAC demand requirements to make upgrades and system expansion more predictable and affordable. From conversion of initial plans and working blueprints through our AutoCAD system to the building and installation of all systems, we can help you save money every step of the way. Contact IT Landes to request a Residential or Commercial estimate, service, or fuel delivery appointment.